Dr. Okan Acar'ın İnternet Sitesi: What is Inflation? What are the Types of Inflation? What is Inflation? What are the Types of Inflation? Before going into details we must define inflation. According to Cambridge Learner’s dictionary inflation is “the rate at which prices increase, or a continuing increase in prices”. Since Turkey has been living with hyper inflation for more than 30 years, the public knows that inflation is the increase in the prices. But in reality, inflation is the general increase in the price level. Therefore we shouldn’t call each price increase as inflation. In the following figure the inflationary process has been tried to be shown. 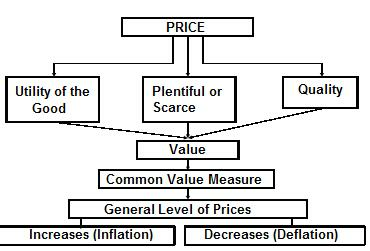 Cost inflation can be seen in different economies and happens if the general price level increases due to the increase in the costs of the production of goods or services. The increases in wages of employees and foreign exchange rates, high interest levels and the increases in the prices of the imported goods cause the increases in the costs of production. Therefore it affects the prices of the companies for the final product. The other very well known inflation type is the demand inflation. If the investments or the spending is greater than the savings in an economy, demand inflation occurs. This means that total demand exceeds the total supply in order to cause a general and continuous increase in the prices. Demand inflation can be formulated according to the following statement. The variables that are shown in this formula are; Y as yield, M as import, C as consumption, I as investment, G as governmental spending and X as exports. When we deal with the hyperinflation, we see that the monthly increases are in average 50% and annually 1.000%. The slow increases do not affect the economy negatively. But if any increase in the price level causes another increase in the costs and the wages and this causes another increase in the price level, we can say that this is hyperinflation. The last inflation type is the hidden inflation. In this case, the prices increase very slowly and the public may not feel it therefore the depreciation is very small and can be covered by interest rates. The demand may be higher than the supply in the current prices. The increase in the prices of imported goods. The ineffectiveness of governmental or public agencies. The savings may be low than the spending. The increases in the emission. Current deficit in state’s balance sheet increases. As seen above inflation is a very serious problem for all countries. Therefore the governments try to find the ways to solve these problems with different methods. TCMB, Enflasyon, Ankara, TCMB, 2004, p. 3. Tolga Karauysal, “Enflasyonun Psikolojik Etkisi”, Yayınlanmamış Yüksek Lisans Tezi, Dumlupınar Üniversitesi, 2004, p. 3. T.C. Hazine Müsteşarlığı, “Reel Ekonomi”, http://www.hazine.gov.tr/arastirma/reel_ekonomi.pdf. Erdoğan Alkin, vd., Genel Ekonomi Ansiklopedisi, İstanbul, Miliyet, C.I, 1987, s. 271.